Palliative care (pronounced pal-lee-uh-tiv) is specialized medical care that focuses on relief of the symptoms and stress of serious illness. The goal is to prevent and ease suffering and to improve quality of life for patients and their families. Palliative is appropriate at any age and any stage of an illness. And, it can be provided at the same time as curative treatment. Q: How do I know if palliative care is right for me? A: Palliative care may be right for you if you suffer from pain or other symptoms due to a serious illness. Serious illnesses may include: cancer, cardiac disease, respiratory disease, kidney failure, Alzheimer's, HIV/AIDS, amyotrophic lateral sclerosis (ALS) and multiple sclerosis (MS). Palliative care can be provided at any stage of illness and along with treatment meant to cure you. Q: Where do I receive palliative care? A: Palliative care is provided primarily in the hospital. However, it can also be provided in long-term care facilities and at home. Q: Does my insurance pay for palliative care? A: Most insurance plans, including Medicare and Medicaid, cover palliative care. If costs concern you, a social worker or financial consultant from the palliative care team can help you. Q: How do I get palliative care? A: Ask for it! Most of the time you have to ask your doctor for a referral. Tell your doctors, nurses, family and caregivers that you want palliative care. Q: What can I expect from palliative care? A: You can expect relief from symptoms such as pain, shortness of breath, fatigue, constipation, nausea, loss of appetite and difficulty sleeping. Palliative care helps you carry on with your daily life. It improves your ability to go through medical treatments. It helps you better understand your condition and your choices for medical care. In short, you can expect the best possible quality of life, this includes coordination and communication between physicians, nurses, soical workers, assistance with paperwork, and spiritual support. Q: Who provides palliative care? A: Usually a team of experts, including palliative care doctors, nurses, and social workers, provides this type of care. Chaplains, massage therapists, pharmacists, nutritionists and others might also be part of the team. Q: How does palliative care work with my own doctor? A: The palliative care team works with your own doctor to provide more support for you and your family. The team provides expert symptom management, extra time for communication and help navigating the health system. Q: What does POLST do? A: POLST makes your treatment wishes known to doctors and other members of your health care team. Too often, patients near the end of their lives may get treatment they do not want. These treatments may not help them live longer or better. Sometimes this treatment can cause pain. POLST gives you a way to tell doctors, nurses, and other health care team members what types of treatment you want. A: POLST makes your wishes clear to your family members and care givers. Sometimes, family members have their own ideas about what types of treatment their loved ones would want. POLST makes sure your family members and care givers know exactly what treatments you do and do not want. No one has to guess or argue. Q: Who should have a POLST? A: In particular, anyone with a serious, chronic illness should have a POLST form. Anyone who wants to make their wishes known is eligible to complete a POLST form, regardless of their health status. POLST forms can be revised at any time, and as your status changes. Q: Is POLST different from an Advanced Health Care Directive? POLST is a legal, physican-signed order that directs health care professionals about your treatment choices. Q: Who can help me fill out a POLST form? A: Your doctor, nurse, social worker, or chaplain can help fill out the POLST form. Make sure you talk with your doctor about the treatments you want and don't want. The form must be signed by your doctor, and you or the person you pick to make decisions for you. Q: What do I do with my POLST form? A: Once signed, the POLST form will become part of your medical record. The form stays with you all the time. If you are moved between locations, your POLST form will go with you. 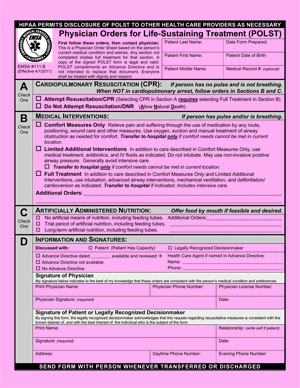 Copies are just as valiad as the original pink form, so give copies to your doctor, family, and decision makers. Be sure to discuss your preferences with them. Keep the original pink form with you. Q: What if I want to change my POLST form? A: You and your doctor can change your POLST form whenever you want. It should be updated whenever your medical condition changes.